Alocasia Borneo King is the result of a lot of breeding to produce a large upright growing Alocasia that can reach monstrous size in northern climates. The plant is similar to Alocasia Odora as far as hardiness and vigor but with the size of Alocasia Borneo giant which can grow to giant size in far southern states. 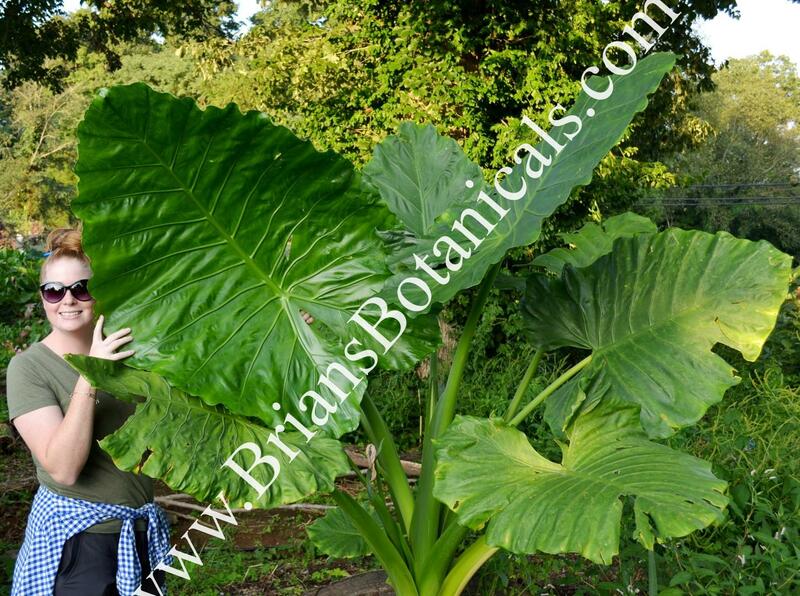 Many customers have seen photos of me standing next to Borneo giant in the tropics and wish they to could grow them that big in the north now it is possible with Alocasia Borneo King. Alocasia Borneo King grows from small plants to 4 to 8 feet in one season and can reach even larger size the following season. The leaves are large upright foliage usually 3 to 4 feet long and 3 to 4 feet wide. As the leaves mature they tend to have a rippled effect which is often seen in Borneo Giant. With age a large trunk will form. Alocasia Borneo King preforms best in full to part sun in rich organic soil. Water regularly but give drainage, plants grow largest in wind protected areas.